280 page book. 8 ½" x 11", $25. Good for most eastern states. Grow and store food when times are tough. The easy way to get started now. Improve on what you are already doing. Live the old-fashioned way: healthy, natural, organic. 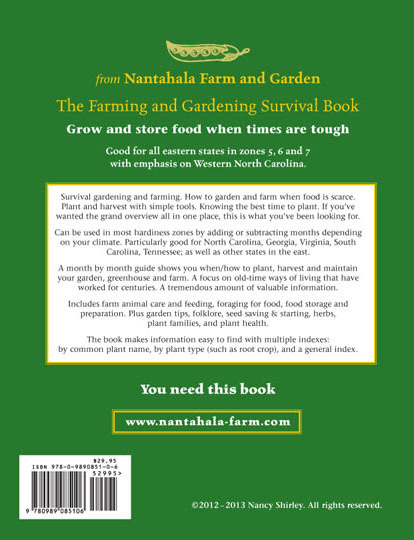 Survival gardening and farming in hard times. How to garden and farm when food is scarce. How to plant and harvest with simple tools. The best time to plant. The grand overview all in one place. You need this book today. Can be used in most hardiness zones by adding or subtracting months depending on your climate. Good for North Carolina, Georgia, Virginia, South Carolina, Tennessee and other states in the east. A month by month guide when / how to plant, harvest and maintain your garden, greenhouse and farm. The focus is on old-time ways of living, natural and organic. There is a tremendous amount of valuable information in this book. 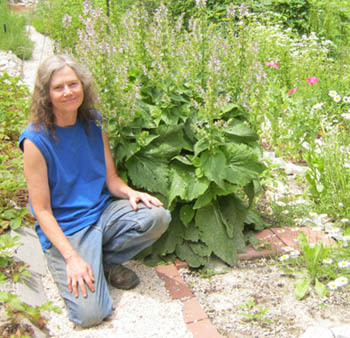 This is a photo of the author, Nancy Shirley, in her front garden by Clary Sage. She loves growing many different kinds of plants especially unusual ones like this huge sage. Nancy giving a farm tour. The greenhouse is in the back. 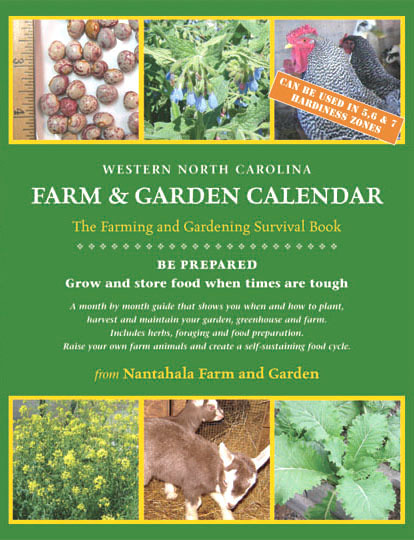 When you own this book, you have a garden and farm expert helping you every step of the way. There's no other book like this one. Good for North Carolina, Georgia, Tennesse, Virginia, South Carolina and most eastern states. 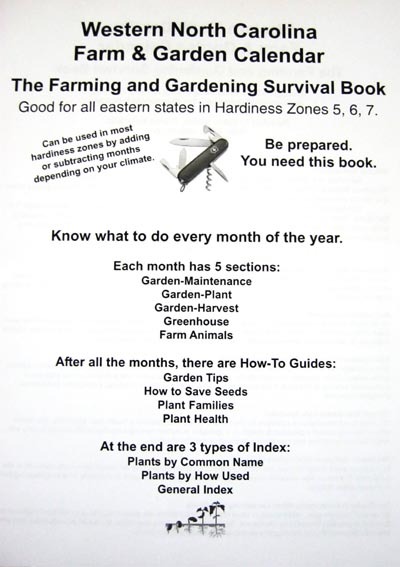 Good for USDA Hardiness Zones 5, 6 and 7. One book: $25 + $3.99 shipping. Pay with Paypal. Book signed by author, Nancy Shirley: $27 + $3.99 shipping. 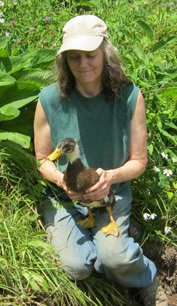 Includes farm animals, foraging, food storage, and food preparation. 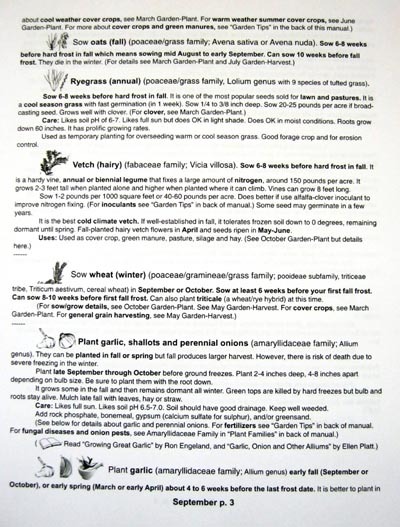 Plus garden tips, folklore, seed saving, seed starting, herbs, plant families, and plant health. How to farm the old-fashioned way, natural and organic. The book has an index by common plant name, an index by plant type such as root crop, and a general index. 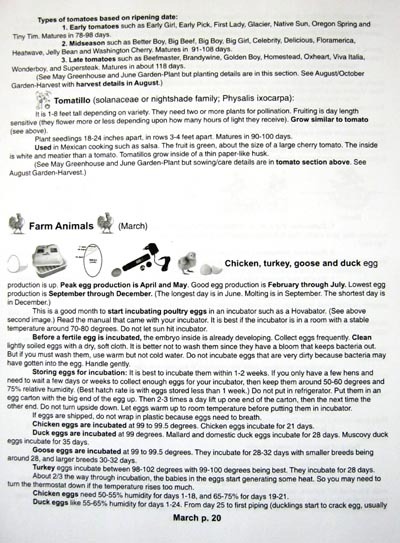 Each month explains what you need to do to stay on top of your food production plan. At the beginning of every month the Calendar lists an overview of what needs to be done. 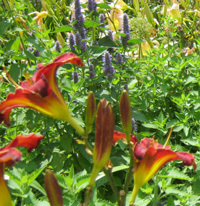 Every plant includes its botanical name along with common names. 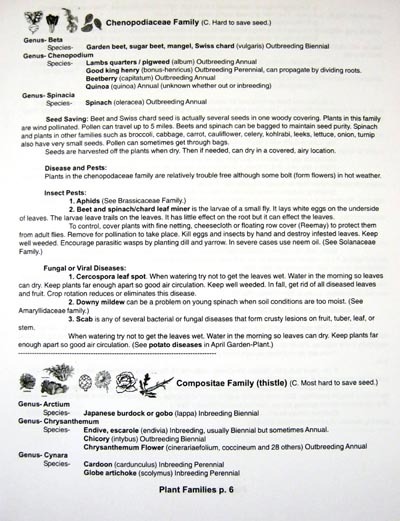 After each description of a plant or animal, there are recommended books to read and where else in the Calendar that plant or animal is mentioned. 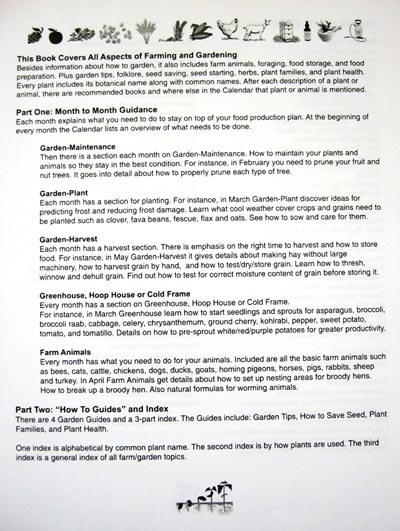 Then there is a section each month on Garden-Maintenance. How to maintain your plants and animals so they stay in the best condition. For instance, in February you need to prune your fruit and nut trees. 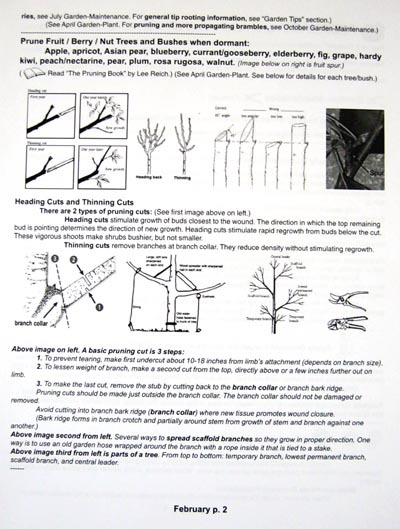 It goes into detail about how to properly prune each type of tree. In September Garden-Maintenance you are reminded to cut off the flowers and small fruit that will not ripen before frost so all energy goes to the remaining flowers and fruit. Each month has a section for planting. For instance, in March Garden-Plant discover ideas for predicting frost and reducing frost damage. Then learn what cool weather cover crops and grains need to be planted such as clover, fava beans, fescue, flax and oats. See how to sow and care for them properly. In September Garden-Plant find out what (and how) should be planted such as garlic and perennial onions for harvest next year. Hairy vetch, annual ryegrass, winter wheat, winter radish and radicchio are good to plant this time of year. Each month has a harvest section. 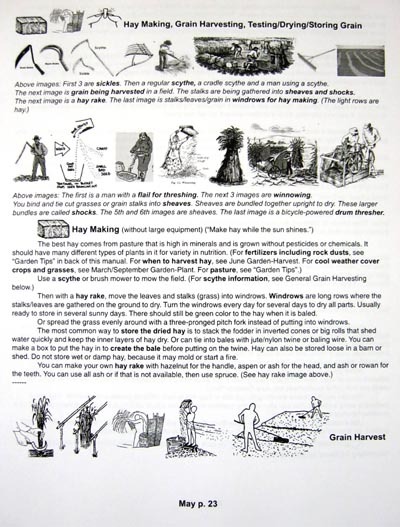 For instance, in the Garden-Harvest section of May it gives details about making hay without large machinery (no gas/diesel), how to harvest grain by hand or with small manual tools, how to test/dry/store grain. Learn how to thresh, winnow and dehull grain. Find out how to test for the correct moisture content of grain before storing it. Study drawings of different types of solar food dryers. Most people don't know these skills but you need to know them to be self sufficient. Plus there are drawings and photos of this equipment and how to use them. 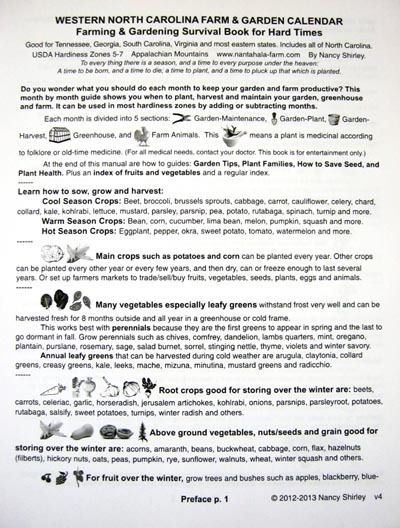 There is a lot of emphasis on the right time to harvest and how to store food that you grow. In September Garden-Harvest see what is involved in foraging and preparing hazelnuts, hickory nuts, acorns and walnuts including differences among varieties. See how the old-timers cracked, mashed, cooked, dried and stored them. In October Garden-Harvest see which plants to harvest before frost, after light frost, after hard frost, or anytime throughout winter. And how to store them after you pick or dig them including root cellars and clamps. Every month has a section on Greenhouse, Hoop House or Cold Frame. For instance, in March Greenhouse learn how to start seedlings and sprouts for arnica (medicinal herb), asparagus, broccoli, broccoli raab, cabbage, celery, chrysanthemum, ground cherry, kohlrabi, pepper, sweet potato, tomato, and tomatillo. Also details on how to pre-sprout white/red/purple potatoes for greater productivity when you plant them later. In September Greenhouse find out which plants to sow such as arugula, claytonia, endive/escarole, mache, mizuna, minutina, mustard, pak choi, parsley, scallion, swiss chard, tatsoi, and turnip. Some of these can tolerate temperatures down to 0 degrees and still keep living. Every month has something you need to do for your animals. Included are all the basic farm animals such as bees, cats, cattle, chickens, dogs, ducks, goats, homing pigeons, horses, pigs, rabbits, sheep and turkey. 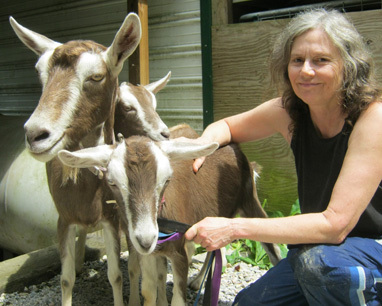 For instance, in February Farm Animals read about the common dairy/meat/fiber goat breeds, how to care for goats, and how to milk a goat. Get information on clabbering milk (fermenting) so it stores longer and is better for you. In April Farm Animals get details about how to set up nesting areas for broody hens. How to break up a broody hen. Also formulas for worming animals with herbs and other natural methods. Four Guides and a 3-part index. 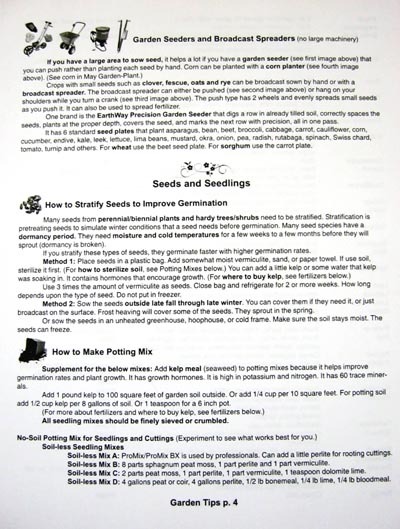 The Guides include: Garden Tips, How to Save Seed, Plant Families, and Plant Health. 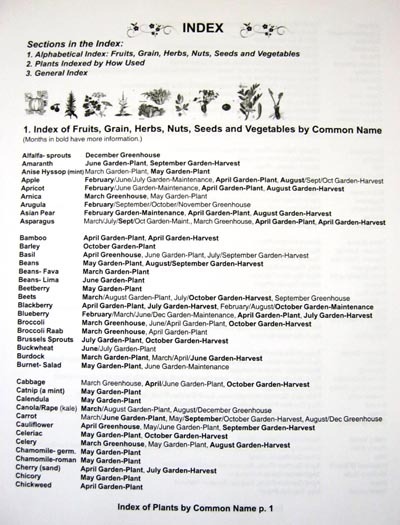 One index is alphabetical by plant name. 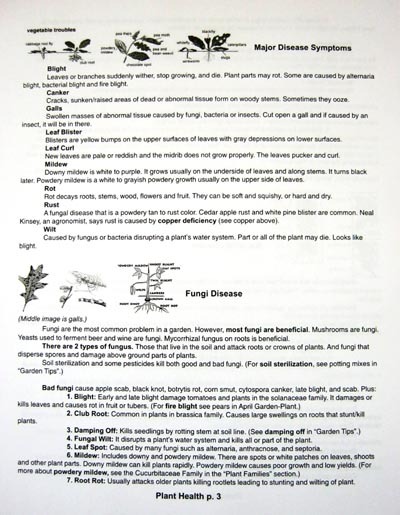 The second index is by how plants are used. 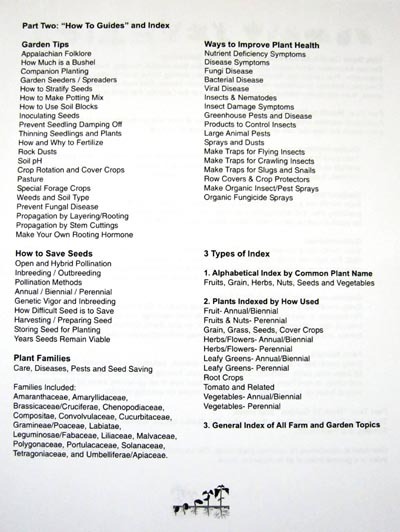 The third index is a general index of all farm/garden topics. To order, pay with Paypal. There's no book like this one. All living creatures are divided into groups and subgroups. Each successive group has fewer members. Going from large to small: Kingdom (plant or animal), Division/Phylum, Class, Order, Family, Genus, Species, and Variety. There are many genus in one family. There are many species in one genus. There are many varieties in one species.